September 21, 2017 is the International Day of Peace – Jupiter has been travelling through Libra since Sept 9th, 2016 and it is ending its trip on the 10th of October 2017 and with the Moon in Libra today, they are giving honour to this day! With so much happening in our world nowadays it is important to remember to negotiate where both parties benefit equally. Libra is a cardinal air sign, ruled by Venus & represented by the scales of justice. The element of Air reminds us that we need to think and then initiate (cardinal modality) sequences of events to get things. Libra is the sign in which the person first makes an accommodation to another person in a one to one relationship. Libra is the sign of Venus – the goddess of Love. Libra represents the Art of getting along and to obtain what we want through negotiation: WIN – WIN!! Jupiter and the Moon for the next 2 days are clearing the path for the Sun to enter into Libra on Saturday 23, 2017 marking the Equinox! Autumn Equinox for the Northern Hemisphere and Spring Equinox for us – Southern Hemisphere. 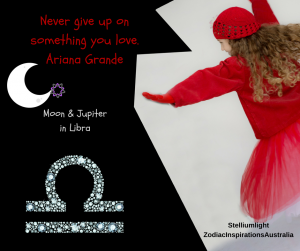 Ariana Grande was born on Jun 26, 1993 with Sun in Cancer + Jupiter and Moon in Libra together that gift her with her charming personality and popularity!!! . Interestingly enough she was performing a Concert on 22 May 2017 and a homemade bomb was detonated as people were leaving Manchester Arena. Then as a response she organised a free concert for the community. Tomorrow evening September 22, 2017 will be the last day of Moon and Jupiter in Libra together for the next 12 years. From October 11, 2017 and Nov 8th, 2018 the Moon and Jupiter will meet every month in Scorpio. Tomorrow evening a very light ringlet of the Moon will be with Jupiter. Take advantage and enjoy the next 2 days!! !